With 5Mp rear iSight camera, iPad mini could be a good assistant to help capture the beauty of life, record memorable moments by snapping photographs. For its portability, you can take it anywhere you go and enjoy photos on it. Also you can move your computer photos to iPad for enjoying. In the following article, I will provide some tips and tricks for iPad mini users about photos. This is a common problem for many people, especially for new iPad users. What is an easy and effective way to transfer photos from computer to iPad mini? Of course, iTunes can do that. 1. Download and install iTunes on your computer, then launch it. 2. Connect your iPad to the computer with the data cable and select your iPad mini from Devices. 3.Click on the Photos tab, and check the box “Synch photos from.” , click “Choose folder ” to locate your picture folder. 4. When photo folder is listed, click the “Apply” button in the right bottom of the screen, it will begin to sync photos. Also you can use Wireless Transfer App to download photos from computer to iPad mini via Wi-Fi. It will be more easy and quick. It is very easy to move iPad mini photos to computer. Downloading iPad mini photos to computer is the same with getting photos from digital camera. 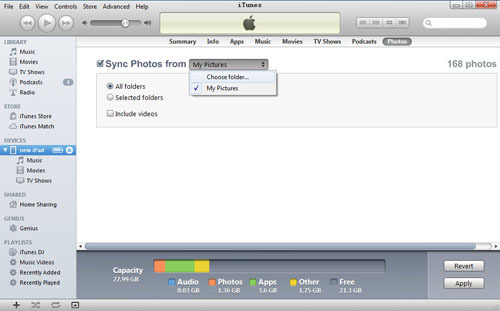 Just connect iPad to computer with the data cable, then click your iPad device in My Computer to locate the photos, copy photos and paste them to a folder in your computer. Also you can use Wireless Transfer App to download photos to computer via Wi-Fi. Open an album in Photo Library, tap “slideshow” on the right top of the screen, choose a transition, then you can view photos in this album in slideshow. 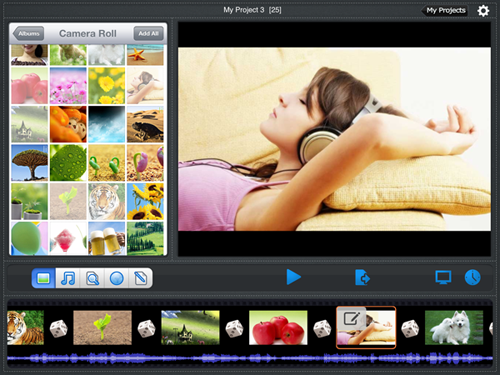 However, what about creating a slideshow with more 3D transitions, customized pan&zoom, text, music etc? In this case, you can use professional slideshow app for iPad mini—Photo Slideshow Director HD. After customizing slideshow is finished, you can save it to Camera Roll, or publish it to YouTube and Facebook directly, or wireless transfer it to your computer. Even you can watch the slideshow on your HDTV. It is a simple but powerful slideshow app for iPad min. You can buy it in iTunes at $3.99. For iPad mini has no disk drive, you need to transfer photos to computer first, then burn iPad mini photos to DVD on computer. You could transfer photos from iPad mini to computer by reference to issue 2.Regarding burning photos DVD, you could use Windows DVD Maker on windows and Burn on Mac. Both software are free. With a large screen, HDTV is a good choice for showing photos to many people in a room. To enjoy iPad mini photos on HDTV, you can stream iPad photos to HDTV with airplay or connect iPad to TV with Apple Digital AV Adapter and HDMI cable(More). 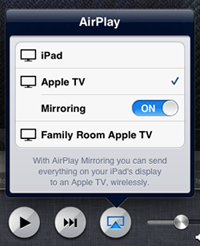 To airplay your iPad mini photos on TV, you need to have an Apple TV. 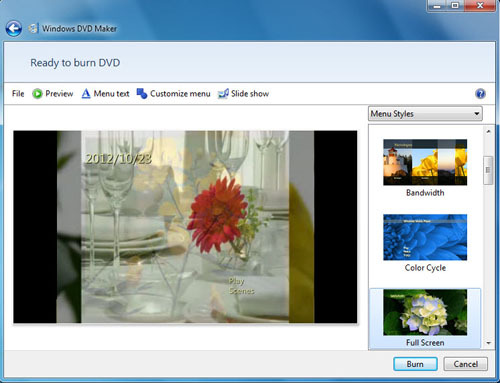 Even you can burn photos to DVD and play them on TV with a DVD player.